DEC PDT-11/150 – Part 6. Looking at the disk drives. 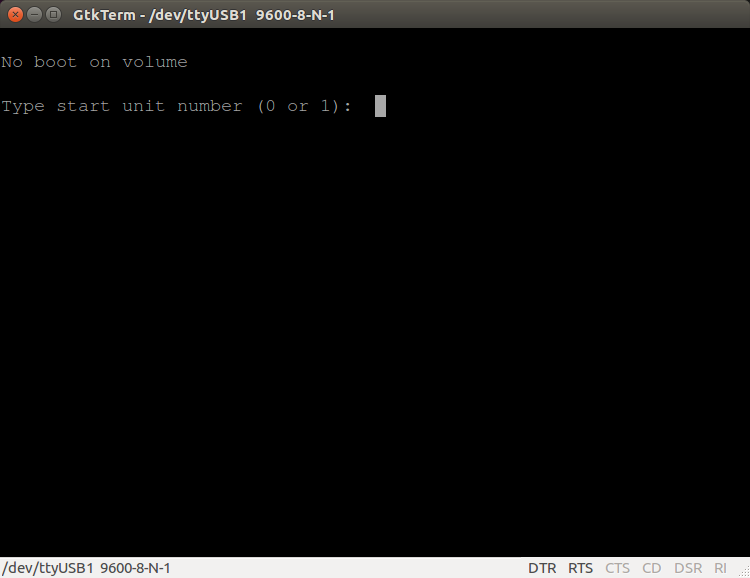 I am now at the point where the disk controller is passing the RAM test but is hitting another fatal error. The Manual says there is a problem seeking to track 0 and I should replace the defective drive. That’s more than a little harsh and frankly isn’t an option. When I unscrew the rear cover on the bottom disk drive I am greeted with this image.. 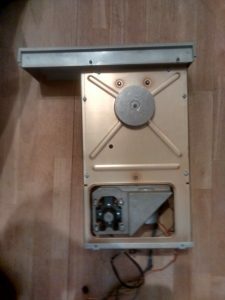 There is nothing so obvious looking in to the top drive but on removing the drive I get a similar story. This is the top drive bay with the drive removed. You can clearly see that both drive belts have fallen off their respective pulleys. So what has happened is that the belt have lost their condition over the thirty or so years that they’ve been on the drives and just don’t grip any more. As you can imagine, new belts from DEC are not an option, so I need to improvise a little. Snipping through one of the belts and measuring gives a length of 588mm and so a diameter of 558/pi which equals 188mm. Record deck belts are available around that diameter and I have one on order but the suggestions on-line say they aren’t a good option as they tend to be stretchy. I have also found a flat industrial belt at 590mm length and so I’ve ordered a couple of those. I’ll let you know how I got on. DEC PDT-11/150 – Part 5. The new disk controller RAM arrived. 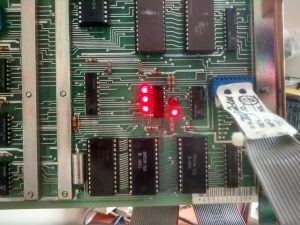 In the last post I had found a faulty RAM chip on the disk controller board and ordered a replacement from a supplier on ebay. Well, the part arrived Today and one fitting, the error lights on the disk controller went out… For a while. I can confidently say that we are past the RAM errors and it is trying to boot but the drive makes a lot of stepping type noises and doesn’t settle down for quite a while. Then the some LEDs on the main board and the controller board light up. This is what we have this time. This time, according to the manual, they don’t mean RAM error. This time they mean. 1, 4&5 on the main board. 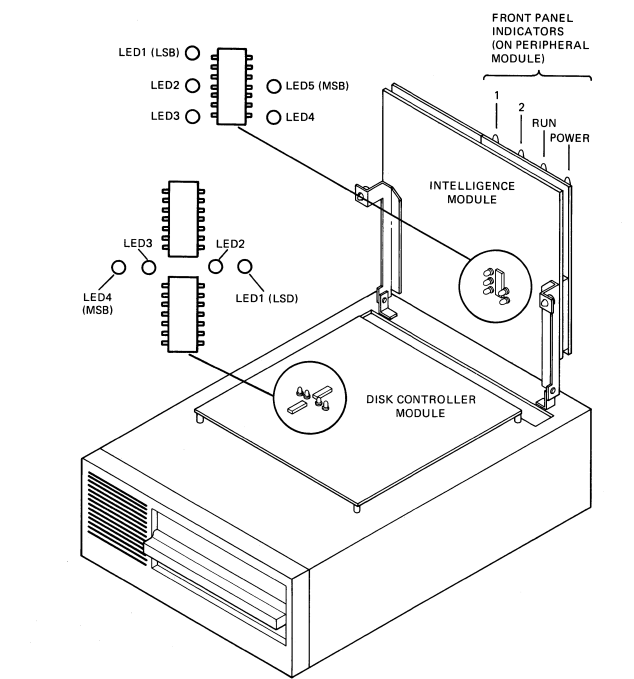 1 on the disk controller. 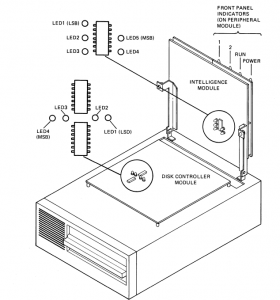 The manual says “Verifies the position of the disk drive 0 head after a restore command is issued.” and the course of action is “Replace defective drive 0 or module.”. Replacement isn’t an option so I’m going to have to go in and see what’s occurring. I have been running some tests and learning a lot about this little machine and its ways. In my second post I couldn’t get to the optional test no matter how I set switch 4 inside and the toggle switch on the back. Instead I was getting an octal number and being dropped into the ODT. I naively thought that this was some kind of RAM value. It wasn’t. This was in fact an error code from the POST. The value I was given, 170732 means there is a RAM fault on the main board. 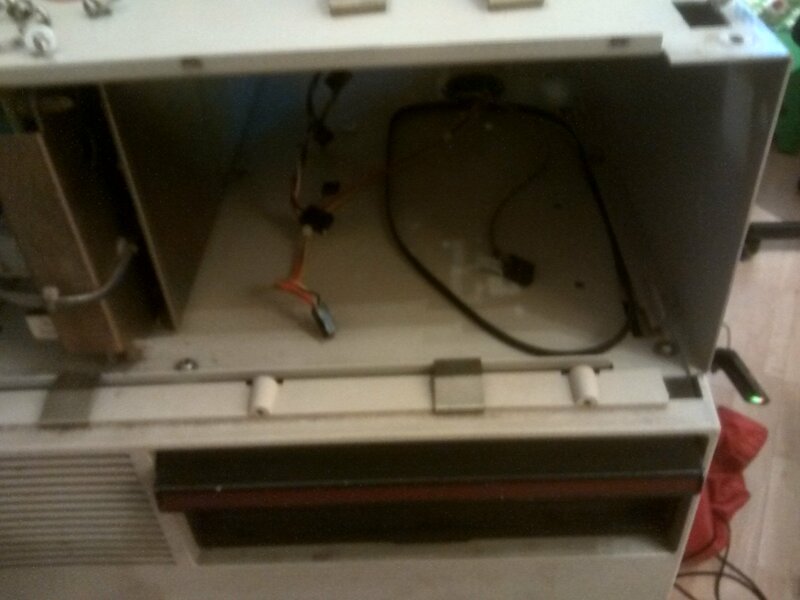 I have spent some time re-seating all of the socketed chips and I think that’s what fixed this. So the reason I couldn’t get to the optional test suite was that the POST was failing. Now that the basic POST is passing, I can get beyond that to the attempts to boot I showed in the last post. At this point it doesn’t make any obvious attempt to access the disk drives. I would expect a little graunching to find track 0 or something similar but there is nothing. I can now try setting the DIP switch and toggle to enable the test mode. With this done and a reboot I get nothing on the terminal at all. Flick the toggle for normal mode and it’s back to the boot prompt. Set the toggle to test and nothing. 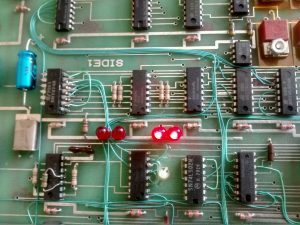 The PDT-11 has a number of status LEDS on both the main board and the disk controller. Setting for test mode again, opening up the lid and separating the boards shows us a number of clues. 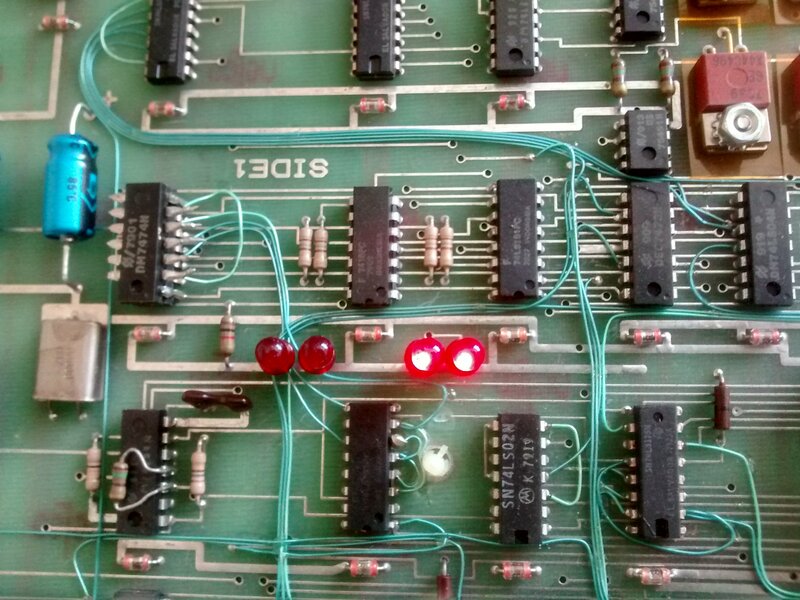 The main board switches are showing 01111 which means “1 Disk controller module” or “2 Cable G1”. 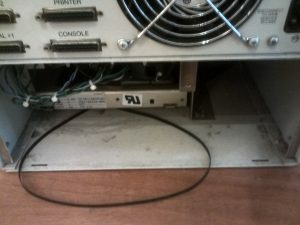 The cable looks fine so it’s the disk controller module. A look across to the disk controller and its lights are showing 0011 which means that the LSB RAM IC is faulty. If that’s true, switching the two RAM chips over should move the problem to the MSB. A quick switch later and the error code on the LEDs has changed to 0010 which means the MSB is now faulty. DEC PDT-11/150 – Part 3. Healing hands. I was preparing to share with you all my efforts driving the ODT with PDP11GUI. I have been using it to assemble Marco-11 assembler code and squirt it across to the PDT’s ODT. The problem is that when I came to fire up the machine to do a bit more and maybe take some screenshots I can’t get to the ODT because the machine is now asking for a boot floppy! So that’s how you get it to try and boot. You write about it on your website and shame it into trying. I am part delighted and part deeply suspicious. Computers don’t heal by themselves. I kind of miss the ODT to be honest. At least with that I could make some progress and fire octal code at it. Not much. It doesn’t seem to touch the disk drives when I answer its question. It just tells me there is “No boot on volume” and asks me again. It doesn’t even seem to rattle the disk. The funny thing is, when it only went to the ODT, it seemed to get the drives to seek to track zero and it’s stopped doing that now. Curious. DEC PDT-11/150 – Part 2. In the last post I described the PDT-11/150 a little bit and the state of play. It was showing signs of life but not talking to me. It turns out the cable wasn’t right. 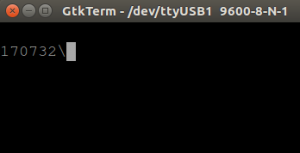 Switch to a new cable, fire up GtkTerm and we’re on the right lines. What we have here is the ODT display. It doesn’t look much but it shows us that the machine is alive and conscious. IT seems a little odd that the switch labelled “Auto Baud” should be set to off to turn Auto Baud on. Really? Ah well. 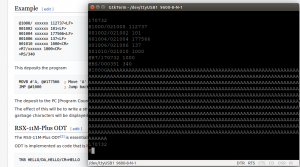 ON – Auto Baud is disabled. Baud rate is set to 9600. ON – Line clock is disabled. OFF – Enable the DRAM refresh. OFF – Disable the test mode. 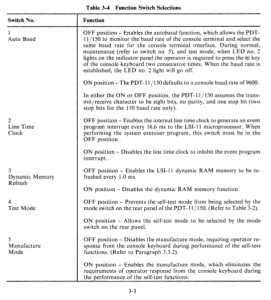 OFF – Disable manufacturer mode. Setting the switches this way I can get to the prompt you see above. I have tried getting into the test mode but it doesn’t seem to work on my machine. I wondered if the self test at power up is failing and dropping me into the ODT but the error light on the front goes out so I guess not. I haven’t turned on the line clock as I don’t know yet if I need an interrupt handler for it. 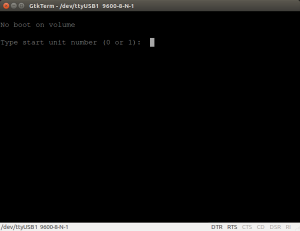 Clearly we need DRAM refresh and fixing the Baud rate at 9600 is just A Good Thing (TM). Now here’s a thing. I can’t find any information about how to get this thing to read a floppy. 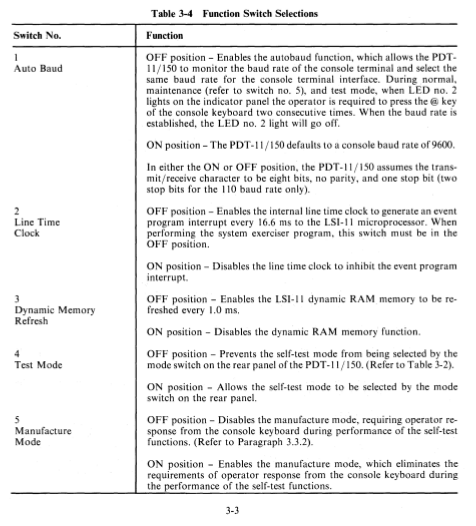 The manual describes setting the switches to get test mode. It says how to insert a floppy and how to handle them safely but nothing on how to boot the machine. I’ve looked at both the technical manual and user guide (thanks to Bitsavers) but there is nothing. 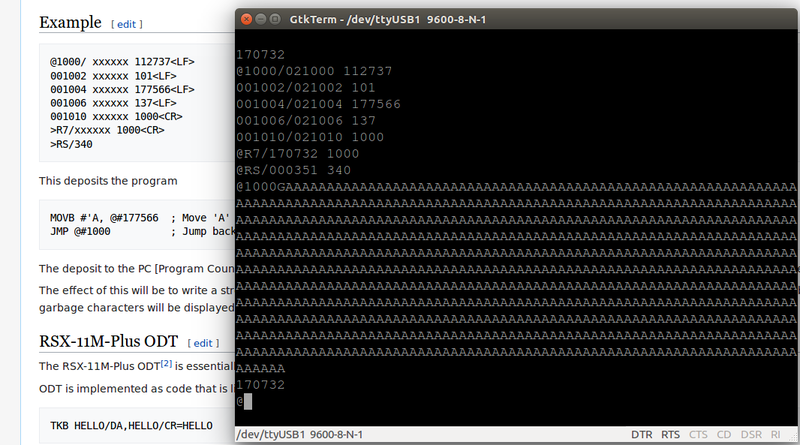 Although I can’t boot from floppy, I can fire in code using the terminal and things are starting to look brighter. Here is an example from the ODT page on wikipedia. This fires the letter ‘A’ at the console port as fast as it can and only stops when you press the reset switch. A short step from where you are. Nascom-1. Back on the workbench – Part 2. Nascom-1. Back on the workbench – Part 1. DEC PDT-11/150 – Part 8. Try new media. DEC PDT-11/150 – Part 7. The disk drive belts. andy on Retrochallenge 2015 – Here we go. UncleBod on Retrochallenge 2015 – Here we go.